Donuts are shining in the snow as the event goes on, and some new premium items joined the game. 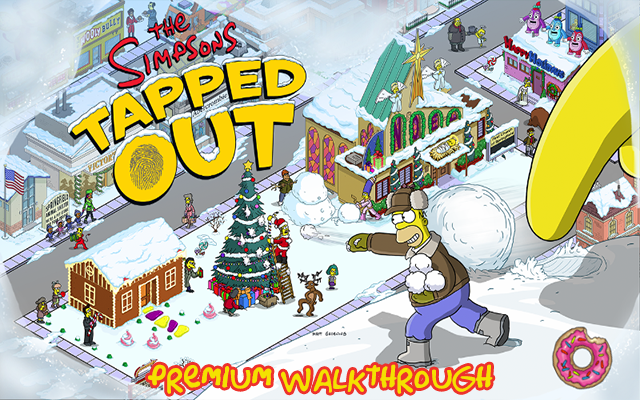 Follow us right after the jump for the complete walkthrough of all the premium items for the duration of the event, including not yet released items! To check the date of release of the items please check our Event Dates post. Hank Scorpio: I call this meeting of the Council of Melodramatic Evil to order. Chairman Kang? Kang: Our first topic of discussion is branding and the ever-changing face of villainy. Dr. Colossus: It has come to the council’s attention that the methods of some members have become outmoded. Mr. Burns: You’re talking about me and Quetzalcohuatl, aren’t you? Mayan God: I have to admit we were both brought to life in the same year of 12 baktun. Mr. Burns: I have it, Smithers! I know how I can update my villainy profile! Smithers: Becoming a hacker, sir? We’ll start by getting you enrolled in a senior’s computing class. Mr. Burns: No, you nitwit! I’m going so old school it will be new school! Straight out of a fairy tale. Mr. Burns: It begins with a pale, elegant evening gown. Smithers: Oh sir, my heart’s aflutter! White Witch Burns: This approach is absolutely perfect, Smithers! I feel like a classic, timeless force of evil! Smithers: You certainly wear it well, sir. White Witch Burns: The nuclear plant can be my personal fortress of power. Have the hounds and robots refitted with an ice theme ASAP. White Witch Burns: And now for an act of evil so fiendish the world will have no choice but cower in my presence! 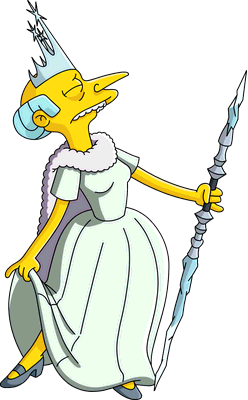 White Witch Burns: Fear me, Springfield! I’ve paralyzed all ground transportation in a frozen grip of eternal winter! Smithers: Actually, sir, some bicycles are still moving around on the streets. White Witch Burns: Is that so… that’s… disappointing. White Witch Burns: No matter. I’ll freeze individual bikes as they wobble by. White Witch Burns: I don’t know if it’s just me, but it seems like a lot more work to freeze the world nowadays than it used to be. Smithers: You’ve got to go icier and colder with all the global temperature increases happening now. White Witch Burns: What bungling fools brought that about?! Smithers: It took many, sir. You most likely had a hand in it yourself. White Witch Burns: Excellent! And with a blast of my ice I will turn back the clock on global warming, as if it never happened! Smithers: Sir, we need to talk about the evil empire’s financials. We’re rapidly running out of money. White Witch Burns: Is money all that matters to you Smithers?! I’m only asking since it matters so much to me. Smithers: Running an empire of ice doesn’t come cheaply. And it’s not great for generating income. Smithers: Selling 99 cent bags of cubed ice isn’t generating enough income to cover the costs. White Witch Burns: Maybe it’s time to ice the world of medicine! Lisa: Ooh, look. 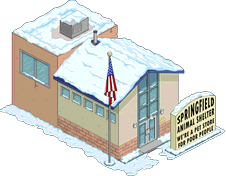 The Springfield Animal Shelter! Lisa: There’s finally a home for all the poor animals that wander the streets of Springfield. Homer: We should see if your Aunt Patty and Selma are in there. Lisa: Very funny. Can we go and pet all the animals, Dad? Please! Bart: Yeah come on, Homer… I’ve been craving to smell like a hundred dogs and cats. Marge: You’re not getting another pet, Lisa! Quimby: There is an ordinance that prevents elephants in Springfield city facilities. Homer: Ooh, fancy. I never knew there were this many variations on the good ol’ tidy-whiteys. Homer: Boxer shorts, boxer briefs, trunks, briefs, jockstraps, thongs, g-strings, and whatever the hell that is. Homer: This could be just what I need to get Marge’s motor running! Homer: Oh Marge! I got you an extra holiday gift. Marge: Oh my… Homie, are you wearing underwear or my knitting yarn?! Homer: I got them on but now I can’t get them off. Marge, I’m very scared. Marge: Don’t move a muscle. I’m getting your power tools. I’ll cut, chop, bore, and torch them off if I have to! Sophie Krustofsky: Dad, can I read you something? Krusty: Not right now, Sophie. Daddy’s not in a listening mood. Krusty: He’s in a headache-after-a-bad-night-of-comedy mood. Sophie Krustofsky: Maybe I could do something for your headache and then listen to me read? Krusty: Sure, honey. Why don’t you go to school while Daddy takes his “hair of the dog” medicine. Krusty: What’s this in Sophie’s school bag? Krusty: Sophie’s got a boyfriend? Krusty: Who is this clown?! It’s my duty as a father to make sure my daughter doesn’t end up with a bum like me! Krusty: Okay, Skinner, gimme the names of every boy who’s ever been within ten feet of my Sophie! Skinner: I don’t think you need to worry. Sophie is a wonderful girl. I wish I’d known her when I was 10. Skinner: Not that I was ever 10. Mother wanted me to grow up fast. From * feeding to driving her to bingo halls… it’s all a blur. Krusty: Well one of your students has been making googly eyes at my little girl and I’m going to put a stop to it! Krusty: I couldn’t find the pintsize punk puttin’ the moves on my Sophie but at least I scared the cafeteria Taco Tuesday outta all those kids. Krusty: I still gotta find this guy. Krusty: There’s no better way to show your love for your daughter than sneaking around behind her back and violating her trust! Krusty: Mel, I’ve figured out who’s been trying to steal my little Sophie! Krusty: I saw her go to the Simpson house. It’s that Bert or Buck or whoever that’s been out to destroy me forever. He’s behind this! Sideshow Mel: You mean Bart – the boy who organized your comeback special and who helped you reconcile with your estranged father? Sideshow Mel: The same boy who cleared your name after Sideshow Bob framed you for armed robbery? Krusty: And now he’s got me right where he wants me… stabbing me in the back by dating my daughter! Krusty: Aha! Busted! You little daughter-stealing delinquent! Krusty: Sophie you’re here with Lisa? Where’s your boyfriend — under the bed, hiding in a laundry hamper, stuffed in this Malibu Stacy beach house? Krusty: Or there is no boy… how can I be a bad clown AND a bad dad? Sophie Krustofsky: You could make it up to me by taking me to the park for some daddy-daughter time. 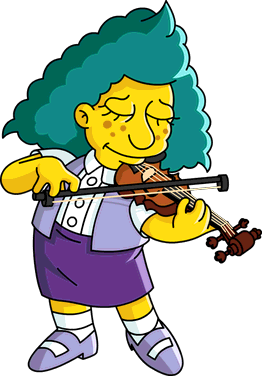 Sophie Krustofsky: And, just so you know, I don’t have a boyfriend. That note was a class assignment about my dad. Krusty: Your dad?! Where is this creep? I’ll joy-buzzer him to death… oh, wait… it’s ME! Sophie Krustofsky: I never forget that. Now piggy-back me to the park! Otto: Hey, little dude. Wanna come join the fun on the Polar Express? Bart: I dunno Otto. You can barely control a school bus. Now you’re running a monorail to the North Pole? Otto: Monorail’s easier. I can drive it with my eyes closed. Which I plan to do. Bart: Maybe I will come along… I need to see what list Santa’s got me on this year. I’m not getting “naughty” six years in a row! Bart: Yo Otto, this train is just going in circles. When are we gonna get to the actual north pole? Otto: No can do, little dude. My pole privileges have been revoked since the accident. Bart: But you said to come ride the Arctic Hypertrain! Otto: I plowed into Santa and his sleigh. You can’t get away with that without making a lot of elf enemies. Otto: Unfortunately this is as good as it gets until Santa chills out and gets the “cool” gene. 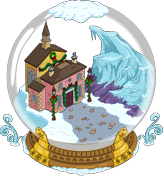 Gil also has two new promos, the first one is the Giant Snow Globe starting December 23rd at 8am GMT. Gil: Giant snow globe! 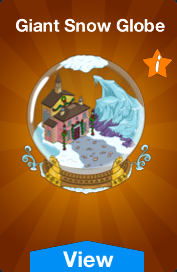 Giant snow globe! Step right up and gaze upon the big and awesome, super-stunning giant snow globe! Gil: Trust, Ol’ Gil. I’m not overselling this like the many loads of bunk I’ve oversold you in the past. Gil: It’s an amazing item, as long as you’re not claustrophobic, scared of heights (Like me) and have a backyard as big as the gardens of Versailles. Gil: It says here that the base is solid gold and handcrafted… and, oh wow. You’re not going to believe what’s inside. Gil: A three-story historical 5-bedroom house perched on top of a fancy glacier! Seems shakier than this sales pitch. Gil: You’ll have your own private little ice mountain! Careful when you’re exploring. Polar bears love to play soccer with the round heads like you. Gil: But don’t worry. Just hold off a couple of weeks ’til global warming puts a crimp in those critters lives. Gil: Oh and since the house is teetering right on the edge of a cliff, I’d invest in a good home protection plan… and a parachute. Gil: That snow globe can house five generations of people and pets. That makes quite a Christmas scene. Gil: Don’t do it for me. Do it for the poor little orphans, and the obese, bearded guy up North, and for undernourished elves that can’t afford vitamins to grow. Gil: I can’t blame you for not buying. You’re one of those odd-jobs that can’t stand to have something wonderful in their life. Gil: Good doing business with you, friend. You won’t regret buying from Gil. And if you do, how ’bout buying some “regret” insurance to go along with your purchase? Mr. Burns: Smithers, what is this? Smithers: It’s a giant snow globe, sir. 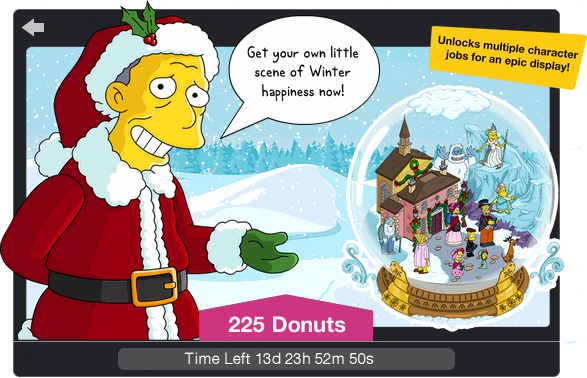 Mr. Burns: Snow globes bring back terrible memories Smithers. Childhood, family… eugh! Mr. Burns: That’s why I use them to trap my enemies. I want them to feel my dread. Smithers: It’s festive. People normally love them. Mr. Burns: Until they’re trapped inside one and the water starts rising! The second one is the Starter pack, this starting December 23rd at 8am GMT too. It’s only available if you just completed the tutorial and you’re level 5/6. Homer: Pff. You think you’re swimming in donuts but there’s never nearly enough to buy all these cool things. Homer: I would’ve had more donuts but some of them fell into a pit while I was cleaning up Springfield. Gil: Well Simpsons! You’re in luck because Ol’Gil has a stash of some good stuff, including donuts! Homer: May I take this opportunity to say, Mmmmm, donuts? Lisa: No, Dad! Not again! Gil: No can do little lady! 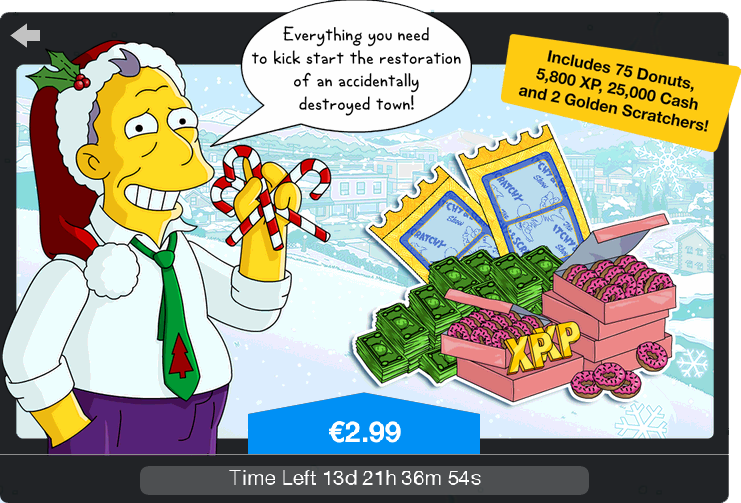 This is a package deal, but don’t worry with these goodies your Springfield will dance right to level 9! Cha-cha-cha! Gil: I started gambling with my life at 8, so why shouldn’t you gamble to win even more donuts with these two Golden Scratch-R tickets! Gil: So Ol’ Gil’s sales pitch did’t hook ya, huh? Guess you don’t jump on great opportunities when they’re sneakily flashed in front of your eyes. Gil: or someone else’s! When you’re blind, it’s no time to be picky! 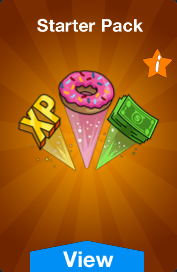 System Message: You’ve been awarded 75 Donuts, 5,800 XP, 25,000 Cash and 2 Golden Scratch-R tickets! System Message: Your 2 Golden Scratch-R tickets are available in your inventory. Tap the Use button there to consume one. 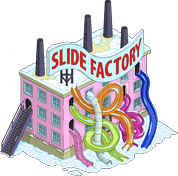 Bart: Oh cool, a slide factory! Finally we get some fun places in Springfield. Quimby: A recent survey of citizens made it clear that we have a 45% deficit of fun activities in Springfield. Quimby: My staff have determined slides are the safest city improvement a mayor can make to achieve re-election. Bart: Awesome, can we get other stuff besides slides? Bart: A helter skelter… A ski hill… A bobsled run? Quimby: Ahmm, I don’t know. I’m afraid that would be a, ah, slippery slope to go down. Luann: Welcome to the Coupon Clippers Club, Marge. Marge: Sorry I’m late. I had to get a babysitter. Homer got stuck at work. Firemen are cutting him free now. Helen Lovejoy: You know, I’ve been in need of a babysitter too. 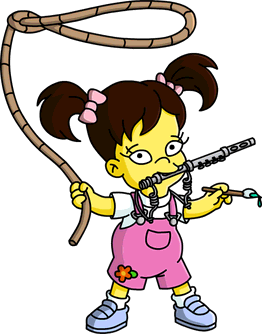 Lucille Botzcowski: Hello, Mr. Simpson, I’m here to look after your littlest one. Homer: Snowball II or Maggie? Hint: take the baby, the cat’s nothing but trouble. Homer: I’m heading out to catch Moe’s Pre-Happy Hour. I hope it’s happier than his regular Happy Hour ‘cause that one’s pretty sad. Homer: There’s food in the fridge, TV’s got four channels, Maggie can show you everything else. Bye-bye! Lucille Botzcowski: Maggie won’t need to show me ‘cause I’m setting up a surveillance camera to see for myself. Lucille Botzcowski: The camera at the Simpson house is working perfectly, I’ll know exactly when to clean out their place. Lucille Botzcowski: Now, to set the same thing up with all the other families in town. Then pull off the biggest score ever! Lucille Botzcowski: Timing is perfect. Lucille Botzcowski: Let’s rob some houses! Lucille Botzcowski: Agh! Every house I go into the baby recognizes me and screams! Lucille Botzcowski: Those little rotten bundles of joy are going to blow my cover. Lucille Botzcowski: Can’t believe my crime spree depends on actually being a good babysitter! Lucille Botzcowski: They’re in the supermarket, in the park, on the streets! Lucille Botzcowski: I just need to get away for a while. Lucille Botzcowski: I feel much better now that I’ve had some time to rest, doctor. Marvin Monroe: As your doctor, I’LL tell you how you feel. Marvin Monroe: … about your childhood! Lucille Botzcowski: My childhood?! Wahhh!! Homer: Oh, look kids, it’s a bear, the serial killer of the animal kingdom! Lisa: Dad, that’s completely untrue! Like most animals, bears generally won’t bother a person if you respect their space and territory. Homer: We’re humans, sweetie. It’s human nature to NOT to respect other creatures’ space and territory. Homer: Now step aside. I’m gonna go rock this bear’s world, Homer-style! Selma: Patty, do you ever open any mail besides sweepstakes entries? Selma: Especially when there are letters from China telling us Madam Wu is coming to visit Ling! Selma: How dare they! They’re checking to see if we’re fit parents. Selma: Quick, let’s drop Ling off at Marge’s so we can smoke up these cartons of cigarettes and finish our 140 hour MacGyver marathon! Selma: Alright, the apartment is as clean as a cheap, smoker’s apartment will ever get. Selma: All Madam Wu will see is a creative space — flash cards on the table, educational shows on TV, and painting supplies for our mini Matisse! Selma: No Ling. You’re getting paint everywhere. I’ll look like the horrible mother of a puny Jackson Pollock. Selma: Uggh… I can’t handle this without another Laramie Lady Long to my lips. Madam Wu: Ling is painting your walls, while you spread your smoke? Selma: No, no, it’s not what it looks like. Ling was about to paint on canvas and I was exhaling my smoke into the fridge. Selma: Gahh the nerve of that woman to worry about the health and safety of my adopted child! Selma: I know how to get her off my back, I’ll run down to the DMV and report her rental car as stolen! 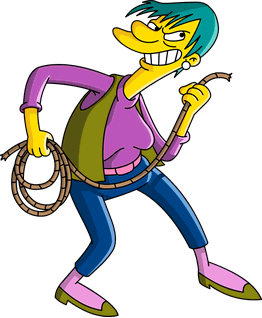 Ling Bouvier: Mama! Let’s play game! Selma: Not now Ling, Mommy has to mess up a foreign visitor’s life! Selma: If Madam Wu needs proof that I’m a good mother then I’ll show her just how talented I’ve made Ling. Ling Bouvier: Me tired Mama. Selma: That’s nice sweetie, but now it’s time to practice being talented. Selma: See how wonderful Ling is! She learned it all from me. Madam Wu: All I see is a talented, very tired child. Selma: I like the “talented” part but the “tired” thing doesn’t sound positive. I can’t lose Ling! She’s made my life worth living! Selma: Uh-oh, a letter from China. I don’t know if I can stand to read what Madam Wu is going to say. You said Ling is available on the 11th. I have Maggie and completed all the quests already. 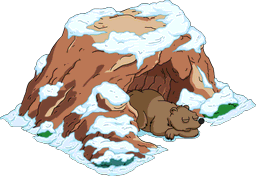 When is the bear and the cave available? how do you get Ling Bouvier? i never saw her for buying. Her father googly eyes pt. 5. The quest did not auto start no idea why anyone have this issue ?